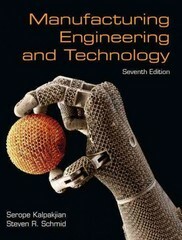 Manufacturing Engineering & Technology 7 Edition For courses in manufacturing processes at two- or four-year schools. This text also serves as a valuable reference text for professionals. An up-to-date text that provides a solid background in manufacturing processes Manufacturing Engineering and Technology, 7/e , presents a mostly qualitative description of the science, technology, and practice of manufacturing. This includes detailed descriptions of manufacturing processes and the manufacturing enterprise that will help introduce students to important concepts. With a total of 120 examples and case studies, up-to-date and comprehensive coverage of all topics, and superior two-color graphics, this text provides a solid background for manufacturing students and serves as a valuable reference text for professionals.